Several years ago--to be exact, it was 9 March 2005--we were taking one of our usual evening strolls around Hilton Pond Center, surveying the trees for early spring migrant birds and noting what wildflowers were coming into bloom. We eventually got to a spot on the pond edge we whimsically call "Hilton Beach," an open, sandier area where we often swim in warm weather. 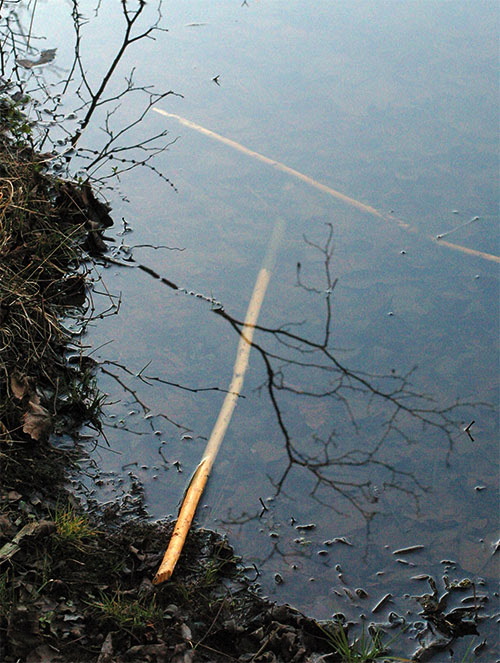 We expected to observe whirligig beetles on the water surface but instead saw something that stopped us dead in our tracks: Two long, thin, pale-colored sticks forming a "T" in the shallows (above). 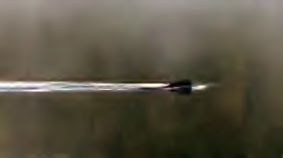 Although we'd never seen this phenomenon on our property, we knew immediately from the exposed end of the closest stick what the "T" stood for; it was a symbol for "Trouble" at Hilton Pond--trouble that meant we were simultaneously "Thrilled" and "Terrified." What we were looking at was our first local encounter with an animal with ability to do some real damage to our little 11-acre nature sanctuary, an animal with incredibly sharp incisors and a penchant for using them, an animal that could gnaw down woody vegetation overnight and decimate trees around Hilton Pond. We speak here, of course, of a semi-aquatic mammal that has been making a comeback in surprising places--none other than nature's energetic engineer, Castor canadensis, the American Beaver. To verify our initial analysis, we lifted the nearest stick out of the water, examined closely, and determined it came from a sapling Sweetgum, Liquidambar styraciflua. 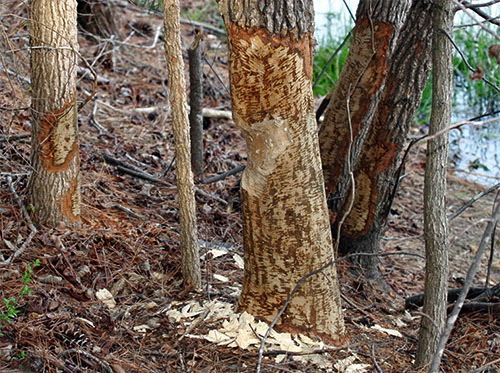 Apparently the Beaver had gnawed it down near ground level with only a few bites of its sharp front teeth and then systematically stripped all the tender bark with additional passes of its incisors. Sweetgums are so-called for a reason. 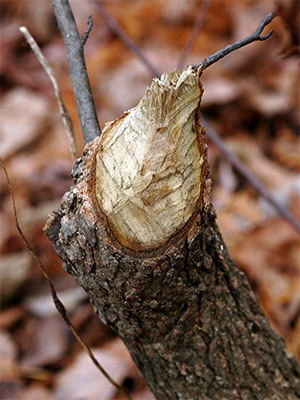 The sap of this tree is relatively high in sugar and must be pretty tasty to a hungry American Beaver; in addition, bark on young Sweetgum trees is fairly thin and soft, so a Sweetgum sapling is an energy-laden snack easy to gnaw. We didn't mind the loss of a few Sweetgum saplings around the pond, but we shuddered to think what might happen to our stately, up-and-coming Bald Cypresses and hardwoods such as Black Cherry and oak if a colony of beavers took up residence in our relatively tiny one-acre water impoundment. For the next few days we kept close watch on Hilton Pond; eventually we saw something at dusk that supported our suspicions: A dark object moving low in the water and leaving a small wake (above left). We had our camera with telephoto lens handy and fired off a single exposure from long distance before the object disappeared beneath the surface. After downloading the image, we determined it was the head of either a Muskrat, Ondatra zibethicus--which we've observed frequently on the pond through the years--or a Beaver. Based on shape, large size, and dark color, we concluded it must indeed be an American Beaver--the 27th mammalian species for Hilton Pond Center. A few days later we got verification from another tell-tale sign: The stump of another small Sweetgum (right), gnawed off to leave a pointy artifact--the trademark of an industrious Beaver. 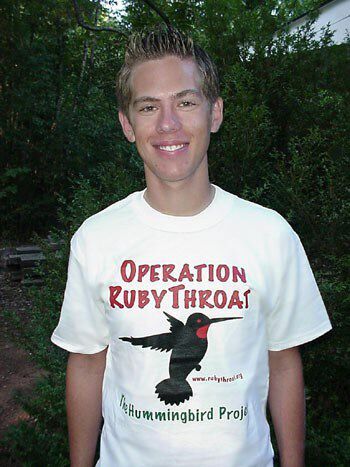 Again, all this happened back in March 2005, after which we saw neither head nor flattened tail of beavers plying Hilton Pond's waters or defoliating its banks--at least not until last week when human company came to town. On 30 March, Jayne Pettus McClain--a member of the board of trustees of Hilton Pond Center--paid one of her periodic visits. We've known Jayne since 1971 when she was in the very first class we taught--eighth grade math at Fort Mill (S.C.) Jr. High School--and have remained friends through these many years. When Jayne arrives she always asks for a Guided Field Trip so we headed off down the trail to see what might have changed since her last visit. Because the old Sweetgum stump in the photo above was still visible, we pointed it out to Jayne and asked what might have caused it. 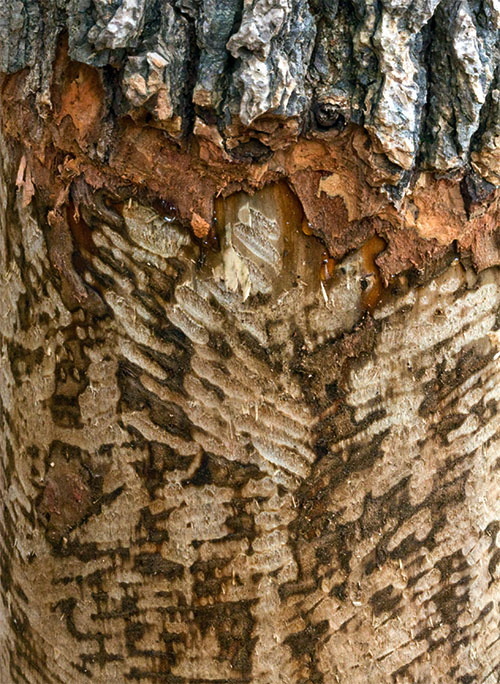 Although she now teaches pre-nursing students at Greenville Technical College, Jayne remembers much about our field biology experiences from decades ago, and she correctly answered the stump was created by a beaver. When Jayne asked whether we had seen beavers lately, we responded we had not and that our trees had been spared any further nibbling and gnawing. Then we continued along the path. Despite such optimism, our pleasant field trip came to a sudden halt when right beside the trail we spotted something new and suspicious (above)--a Sweetgum stump four inches in diameter and 18 inches tall, complete with that pointy little hat that meant a beaver was again at work. The perpetrator had stripped the tree itself--now lying partly in the water--and even chewed off every shred of bark on the stump. 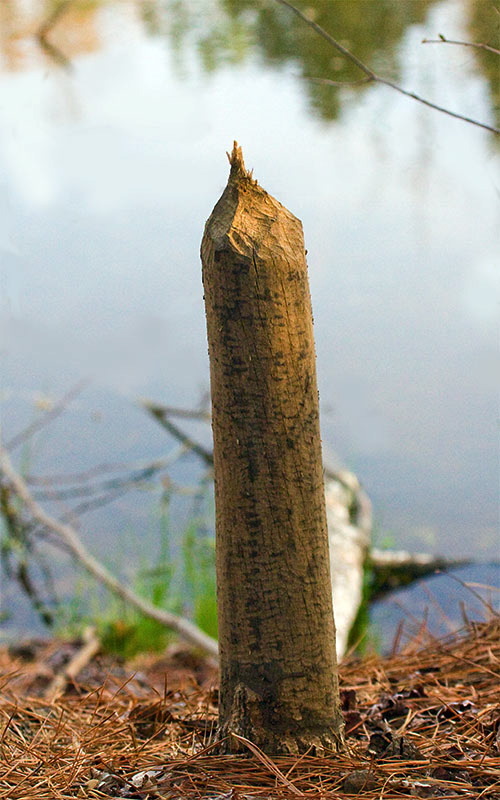 Needless to say, we were taken aback by this unexpected sign a beaver had returned and had renewed its assault on woody flora along the banks of Hilton Pond. 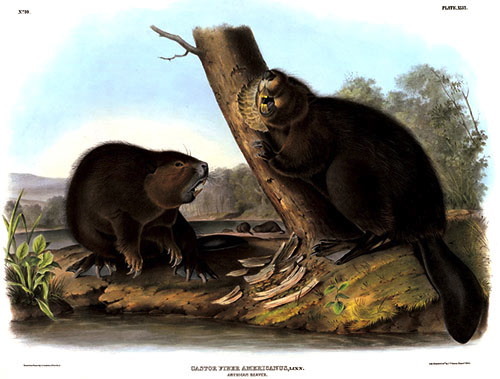 American Beavers--rendered above by John James Audubon--are noted for their industriousness and an ability to turn riparian woodlands into meadows. Furthermore, their prowess at dam-building converts slow-moving streams into ponds; sometimes an entire watershed becomes a series of stair-stepped beaver ponds--each holding back water that provides aquatic habitat for a wide variety of vertebrate and invertebrate organisms. On suitable ponds a beaver may construct its lodge of fallen trees and limbs, but beavers also excavate dens in banks of rivers and lakes. There is no sign of either lodge or burrow around Hilton Pond, so we suspect the animal gnawing on our trees is actually spending more time at Nothilton Pond. After getting over the initial shock of how many trees already have been damaged by beaver activity at Hilton Pond Center, we've decided NOT to take any action that might harm this uninvited guest. Our beaver--and we suspect there's only one--must have come from someplace downstream. Hilton Pond overflows into Nothilton Pond that in turn feeds a stream that empties into Fishing Creek that eventually ends at the Catawba River, so our beaver could have originated from anywhere along that path. There's something to admire in a semi-aquatic animal that wanders far upstream from major waterways to find Sweetgums to its liking; thus, we're just going to sit back and watch what happens as this native species puts its teeth to work on local trees. After all, if our pondside trees are girdled and die while still standing they'll turn into woodpecker heaven; if they topple into Hilton Pond their trunks will become sunning spots for turtles, and their submerged limbs will shelter tadpoles and fingerling fish. When we moved 26 years ago to what is now Hilton Pond Center and decided to quit cutting the grass, the property quickly evolved into young woodland with a pond in the middle; in essence we created a place an American Beaver can call home. Who are we now to deter this well-adapted, buck-toothed mammal from sharing Hilton Pond with us humans? That "T" of light-colored sticks we found in the water in 2005 might have stood for "Trouble" back then, but after further reflection we're "Thankful" to have a place where a beaver can thrive and provide us with opportunity to watch "nature's energetic engineer" at work. --With the departure of most wintering American Goldfinches and Purple Finches from Hilton Pond Center over the past couple of weeks, our seed-baited traps have been mostly empty, and wet weather this week made it unwise to run mist nets. Thus, our banding results for the period were about as poor as they can get (see totals at left). --A male Ruby-throated Hummingbird first seen on 31 Mar was observed every day this week at the Center's sugar water feeders, but he never entered one of our traps. --Flowering Dogwood blossoms around Hilton Pond have finally opened, brightening otherwise gloomy, gray days that hung around all week. The good news was another 1.2 inches of rain; every little bit helps, even though the pond is still about two feet below being full.